I am too overwhelmed by life generally to write. So you’re getting more lists. Today it’s more 153s. I waited til I got to ten more. On January 22, at the end of my workout, I stopped the Corner Gas DVD I was watching and marked my place on it. It was 1:53:53. On February 13, for work, had to look up the USS R. M. Blatchford, which turned out to be the USS General R. M. Blatchford (AP-153). On February 17, while reading the school board report, I saw a mention of Act 153. On March 6, in the town report, same. On March 8, I received tickets to a June concert with the return address 153 Main Street. On March 13, while cleaning out my e-mail in-box after a trip, I looked up and saw the status as 153 messages, 39 unread. On March 26, an early-morning glance at my Fitbit read 153 steps. On March 29 (today), on a work-related Google search, this came up: Geriatrics for Specialists—Page 153—Google Books Result. Also today, but barely worth mentioning, is that when I worked out on my NordicTrack, I happened to glance at time elapsed right at 1:53 (that’s not quite two minutes, folks, and I was already glancing). And just now, when I went to set a timer to go off at 3:00 (an old-fashioned electronic one, not my phone), I put in 1:07, because the time was 1:53. How can I read what I want to read without purchasing another book that will take up space in my house but still hold a physical book in my hands? A year ago, my book group read the first in Elena Ferrante’s Neopolitan Novels (a series of four). I really wanted to read the whole series, but I didn’t want to purchase the whole series. I solved this problem by purchasing them all for my sister for Christmas, thinking she would like them (she did) and thinking she could loan them back to me (she has). I thought I would just skim the first novel to remind myself what was in it, but I ended up being sucked in, and I read it again, which is good when one wants to read a series straight through. Meanwhile, my book group has decided on a couple of tempting titles, which is annoying because I want to read the Neopolitan series uninterrupted. The first of these, which I must finish by tomorrow, is Sylvia Plath’s The Bell Jar. Of course, I used to have a copy, and I got rid of it during my first successful fiction purge. I did not want to purchase the book, so I went to the library. The library! Imagine! Amazingly—given that the book group is local and the library is tiny—I found a copy. It’s a fabulous old hardback that physically reminds me of my childhood reading. 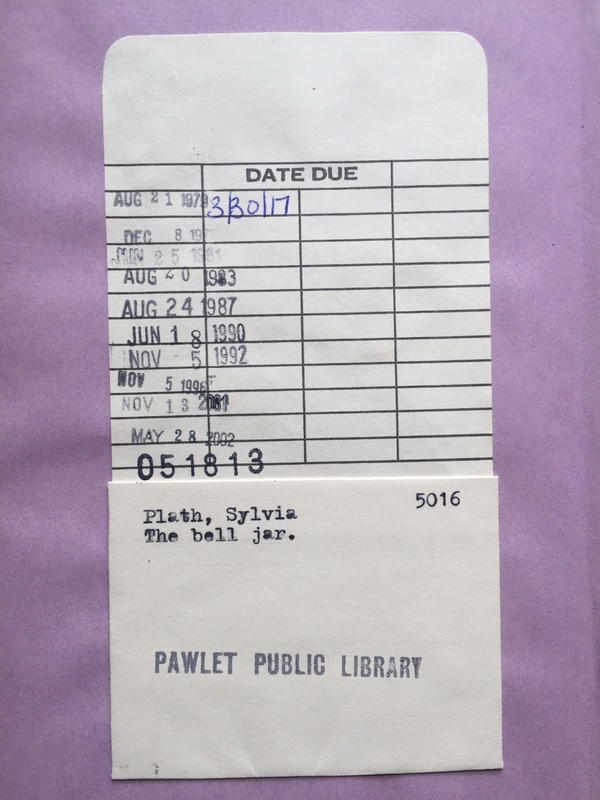 There is a due-date card pasted in the back with the author/title typed onto it and due dates recorded in rubber stamp. There is something nostalgic about reading this rubber-stamped list on a due-date card. These dates represent my last year of high school, some college time, camp counseling, celebrating a first anniversary, living in DC. Between the two November 5 dates, I moved to Vermont. By the next November checkout, I’d moved into this house. I’d turned forty by the first May date and fifty by the second. It’s been almost four years since someone took this book home, but once it sat unread for a decade. It turns out that maybe, despite having an old paperback copy on my own shelf for years, I’d never read The Bell Jar. I don’t remember it. It’s fantastic. I haven’t forgotten about getting rid of 2017 things in 2017. But I’m not making a lot of progress. In fact, too many new things have come into my house since the first of the year. Getting rid of 2017 items means disposing of an average of 5.5 items per day. Today is the sixty-seventh day of the year, which means if I were on schedule, I would have gotten rid of 368.5 items. I count 277, which puts me nearly 100 behind. Today. Things I am not counting: regular in-and-out trash and recycling related to food items and mail, with two exceptions: catalogs and magazines. I put these in my get-rid-of count because they fall into the category of hesitation and saving—I set them aside, sometimes for months, and then I do a major purge. The most recent purge counts for about half of the total, so it’s obvious that I am not spending enough time on this. The consignment shop things, if they don’t sell, could find their way back. So much stuff. So much someone-can-use-this-can’t-they stuff.